Every year over 2 million people visit the excavation of Pompeii and hundreds of thousands visit the remains of Herculaneum, the second city buried by the eruption of Vesuvius in August 79 AD. The volcanic eruption did not last much longer than 24 hours. Thousands of people died, as many exactly know no one. It is certain that only about 1000 bodies were found in Pompeii and about 300 in Herculaneum. But Pompeii had more than 20,000 inhabitants, Herculaneum about 4000. Where are the others? Well, many could have fled. There are reports of survivors. Others may have died on the run. There are excavations only in Pompeii and Herculaneum, not in the surrounding area. Whoever made it out of the city, but was killed by a stone from the volcano, for example, has probably not been found until today. The layers with the material from the eruption are 5 to 25 meters deep. Since the 1870s, during the Excavations Pompeii, when a cavity was found, a plaster cast was made. The bodies were filled with ashes during the volcanic eruption. Later the bodies rotted. What remained was a hollow space. If you filled it with plaster, you got an exact 3D image of the former man. There are also such plaster figures of animals that lived in Pompeii. 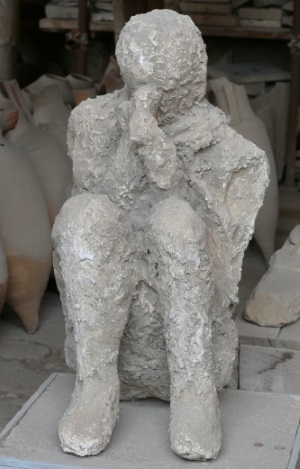 In Pompeii, visitors can see such plaster people. They are surprisingly accurate, even in detail. You can see the position of the body at death. We even thought we could see fear and pain in some faces. The plaster cast method also has disadvantages. Possible remains such as bones of ancient people can no longer be examined. Nevertheless, many plaster casts have been carefully examined by scientists. For example, it was found that in ancient times almost all people had very good teeth, no tooth decay or the like. This is probably due to the nutrition, there were hardly any sweets except honey at that time. 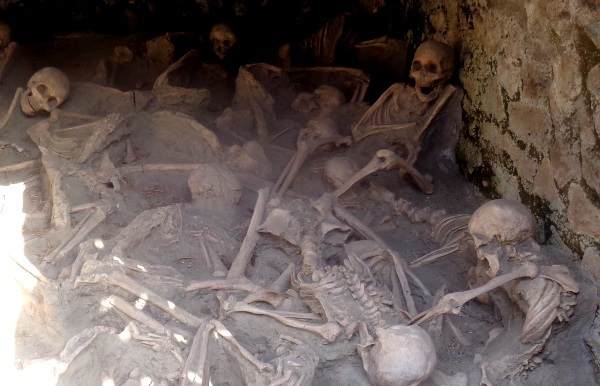 In Herculaneum, however, many skeletons were discovered. Several hundred people found refuge in stable, small buildings in the lower part of the city on the former shore of the sea. Here they died of hot ashes, toxic gases and heat. Some of the skeletons are still there as they were found. Visitors to Herculaneum see many remains of people in each of the small buildings. One mother even had a baby in her arms. These bodies have been examined in recent years using state-of-the-art methods. DNA analysis and other methods have provided many new insights. It was surprising that almost all corpses were well nourished. Almost everyone ate fish and meat. A young woman was probably a vegetarian, even that existed in antiquity. At present there are some projects which investigate the human, antique excrement from the sewage of Pompeii and Herculaneum. Here, too, there are some new things, for example concerning the nutrition of the people of that time. For many visitors of Pompeii the plaster casts of the people are a highlight during the visit of the excavation. In the Excavation Herculaneum the skeletons in the lower area are certainly a highlight.